Recognizing Excellence: We believe the future of our community depends on the skills, character, and civic spirit of our children and the quality of the schools they attend. Our commitment to youth and education means we fund our efforts both through our club foundation's annual fundraising events, and through a separate foundation, the Sebastopol Rotary Education Foundation. The SREF has built up over many years an almost $1million endowment, whose annual income funds the Teacher of the Year program, guarantees continuing, stable funding for other education efforts, and supports larger, multi-year projects that the club could not otherwise fund. (For a lengthier description of SREF, go to www.sebastopol-rotary-education-foundation.org.) In addition, club members spend hundreds of hours a year with students, mentoring and tutoring kids in both our local elementary and secondary schools. Overcoming Obstacles Awards – Many students in high school face significant challenges to reaching to gr aduation. Those who have the grit and perseverance to make it through often want to make a difference, helping others who are facing similar obstacles. These are the kids who will make our future a better place. The Rotary Club of Sebastopol recognizes and rewards such remarkable high school seniors through its Overcoming Obstacles Award Program. Choosing from applicants at our three local high schools, we award six deserving students with scholarships and a half day leadership workshop. 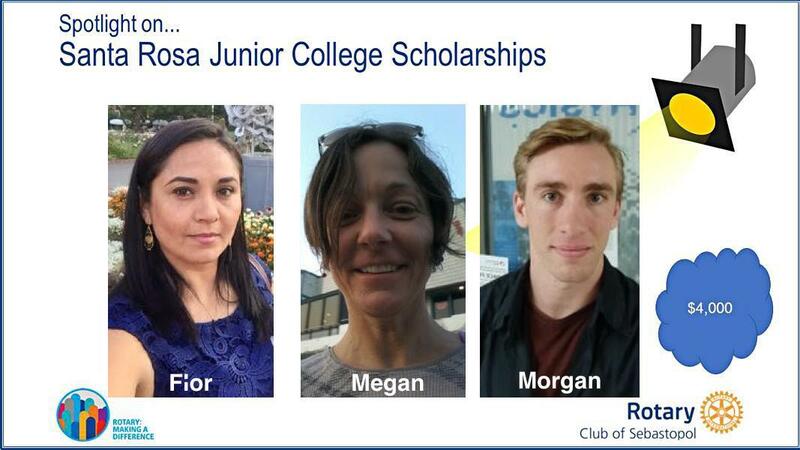 In 2018, each student received a $2000 scholarship and $200 in cash. - a Spanish-speaking single mom with two children who wants to complete schooling so she can get a better job and improve the quality of life for her family. Trade Paths Awards – Sebastopol Rotary recognizes there is far more to high school than just academic performance. Whether the goal of what we used to call “vocational education” is to give a student the grounding in a traditional craft, like wood shop, introduce her to modern agricultural methods, begin to train him for a career in the culinary arts, or teach her to create great video, we recognize the importance of highlighting and acknowledging the extraordinarily creative things students do in school outside the traditional classroom. Each year students from El Molino, Laguna, and Analy High Schools who have distinguished themselves are invited to our Rotary meeting to receive a framed certificate and a cash award. In 2018, we gave the award to two Laguna High School students, Antonio Maya and Eddy Orduna, who have distinguished themselves in their commitment to learning about the construction trades and agriculture. As befits winners of this award, both said they would use their cash to buy new tools. 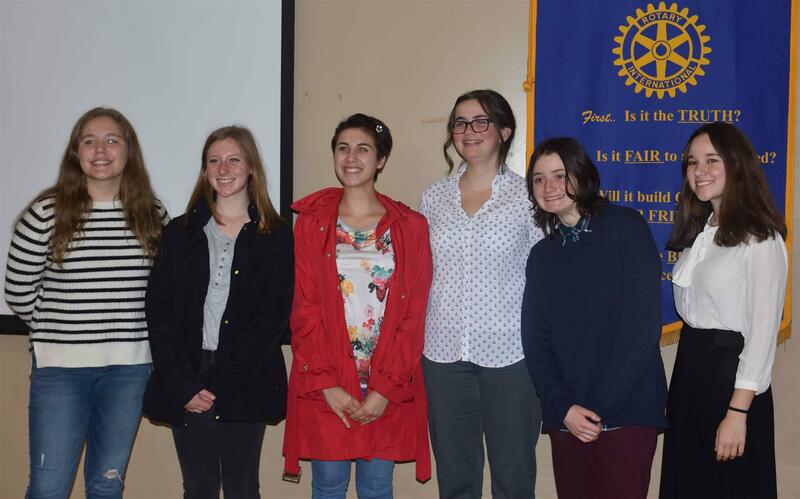 Student Speech Awards – Every year, Sebastopol Rotary hosts students from our three local high schools who show their communication skills by giving six minute speeches on timely issues that reflect the principles of Rotary. In 2018, the subject for the speeches was: "After the fire." This year our six contestants, Emily Cline, Rebekah Cavallo, Marion Hall-Zazueta, Lily Kienlen, Ella Kinderman, and Ryan Debrovner, addressed the topic from a variety of viewpoints. While some spoke directly to their reaction to the devastation, others took more abstract approaches to how a person reacts to fire and destruction, or to the death of a close loved one. The judges named three honorable mentions: Emily Cline, Ella Kinderman, and Ryan Debrovner, each of whom received an award of $75. Third place went to Rebekah Cavallo, along with a $125 prize. Lily Kienlen took second place and $175. This year's winner was Marion Hall-Zazueta, who received $250. Supporting Great Instruction: The Club recognizes the importance of providing great instruction to our students. We support teachers who are thinking creatively about how they teach, and we share our expertise with students where we can. 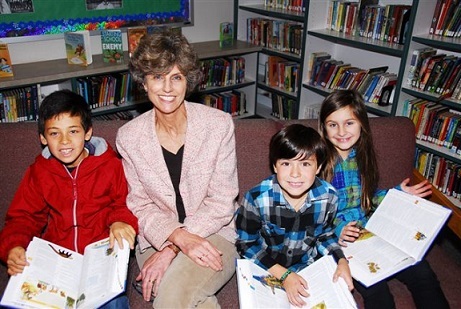 Mark Sell Rotary Teacher Grants ­– The Mark Sell Rotary Teacher Grant Program provides teachers in West Sonoma County with $50 to $500 grants to fulfill a variety of requests. Since the start of the program in 2002, the club has distributed 878 grants to 39 schools totaling almost $275,000. In 2017-18, we were able to provide over $23,000 towards the scores of requests that included 40 electric circuits for a maker class, 21 violin shoulder rests, a weather station, and a math program for 40 students. The funding cycle occurs twice yearly. Mark Sell Rotary Teacher Grants are funded by money raised at our annual Sebastopol Rotary Crab Feed in February. Please come join us, have a fabulous meal and support our terrific teachers. Financial Literacy – In 2009, Sebastopol Rotary envisioned an initiative to address a glarning need: Only one in six high school graduates receive any financial education. Our goal is to reach EVERY senior in our local high schools to discuss topics such as savings and investing, budgeting, credit cards and debt, balancing a checkbook, taxes, insurance, and charitable giving. The students leave with a flash drive filled with resources to help build a successful life. Our club selects local professionals and Rotarians to lead the discussions. In 2010, our first year, we worked with 500-600 students in 13 classes, and have continued these programs ever since. Almost 3000 students have now attended the workshops. 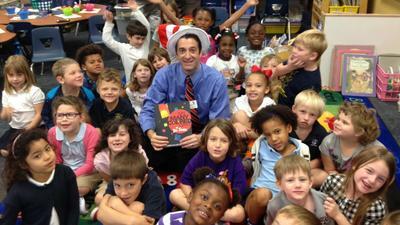 Learn with Me – The club recognizes the importance of reading as the foundation for every child’s success in school. The project begun in 1988 by two members of the club, first focused solely on third graders at Park Side School. It has now expanded to K-5 students at Park Side and 5-8 graders at Brook H aven. Teachers select students who need help and encouragement in their efforts to improve their reading skills, and the Rotarians and other volunteers work with them to overcome their difficulties. In 2017-18, 25 tutors worked with 51 5th grade students in small group settings and 56 K-4 students in one-on-one tutoring sessions. Fifty percent of our students qualify for the Free Lunch program. As a sign of the programs value, all 14 K-5 teachers at the two schools requested Learn With Me tutors. The program has a bigger impact, however, than just addressing reading. It is a way to give students confidence about their ability to improve far more than just their reading. As one Rotarian described the work: “You soon realize that the kids you are assigned look forward to your visit. There’s no stigma. Their faces light up, and they rush to get their books. Dictionary Program – The Dictionary Program provides hard cover dictionaries to all third graders in the schools we support – Brook Haven, Pleasant Hill Christian, Apple Blossom. Orchard View, Gravenstein, Oak Grove, Sebastopol Charters, Park Side, and Salmon Creek. In 2017-18, we distributed almost 400 copies. Even in the computer age, the students value the dictionaries; some of them are thrilled because they have never owned a book before and many still need this useful reference tool because they do not have Internet connectivity at home. West Sonoma County Career Fair – Sebastopol Rotary and Sebastopol Sunrise Rotary partner every year on a Career Fair at Analy High School for students at all three local high schools. Designed jointly with the Analy High School College and Career Department, this event connects employers to students and exposes them to career and volunteer opportunities. Fifty professionals and business executives spend three hours sharing experiences and knowledge with over 500 students and their parents to help guide them on their career choices and college plans. In addition, many companies seek students for part- or full-time job opportunities. To help them get the most out of the event, before the fair, Rotarians help students practice interviewing for a job and reviewing their resumes. For those students interested, the practice interviews are videotaped and analyzed with the help of the Rotarians. See also the website of the Sebastopol Rotary Education Foundation, www.sebastopol-rotary-education-foundation.org, whose board is drawn from the club's membership. SREF has many worthwhile activities, like its Teacher of the Year, which expand the club's commitment to supporting local schools and students.